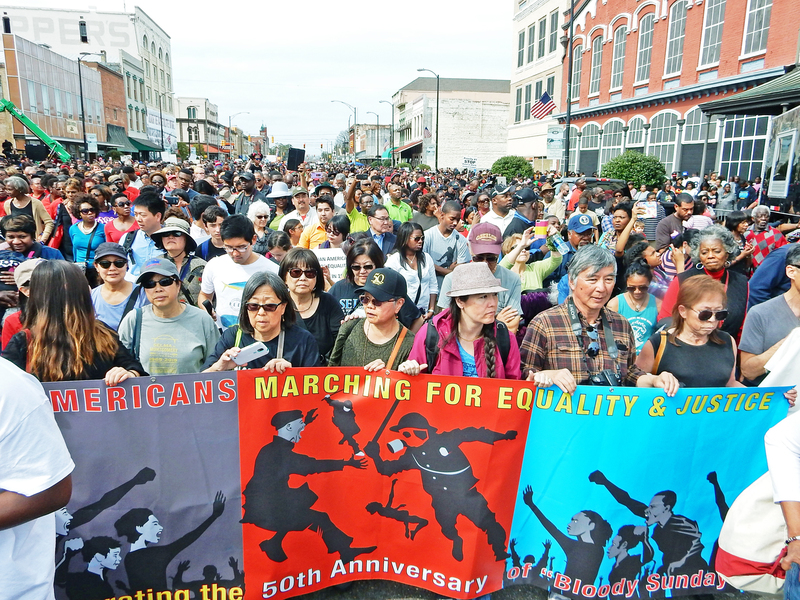 Marching with thousands towards the Edmund Pettus Bridge, my elation turned to concern. We were standing on the site of “Bloody Sunday” 50 years ago where civil rights marchers were beaten, some unconscious, by police and other racists. It was the event that propelled the final passage of the Voting Rights Act of 1965. I looked past the huge crowd to the bridge beyond — a sea of people, all there for a common purpose. But how would we manage? In our group, we had elderly folks, one with a recent hip replacement and another limping with sciatica. We also had a 10-year-old with us. At times, I got separated from our contingent but never felt unsafe. A black woman pulled her two girls closer to her and said, “Let her pass. She’s an elder.” I smiled through quivering lips and walked ahead of them, deeply moved by the considerate gesture. I thought about my parents, who were put into wartime concentration camps … and how, upon returning to the West Coast in 1953, they were told by a white woman, “Oh, we don’t sell to Japs,” never thinking how offensive it was. I thought about how the Civil Rights Act and subsequent state laws were passed to forbid discrimination in housing and employment. So the Civil Rights Movement that saw people beaten and even killed in the South made it possible for Japanese Americans and others to live anywhere we choose. In his speech in Selma, President Obama called it a “solemn debt” that all Americans owed to that movement — Latinos, Asian Americans, women, disabled, LGBT. He even called out Japanese American veterans as part of who America is. The magnitude of the progress made by that movement makes some people think that racism is over. But it’s not. Look at Ferguson, Missouri; Staten Island, New York; or closer to home in South Los Angeles to see that it isn’t. Or to see the attempts to dismantle Voting Rights Act today. As I walked on that bridge, I felt deeply how each time we stand against the marginalization of any group, we are paying a little down on that “solemn debt.” We have a ways to go.